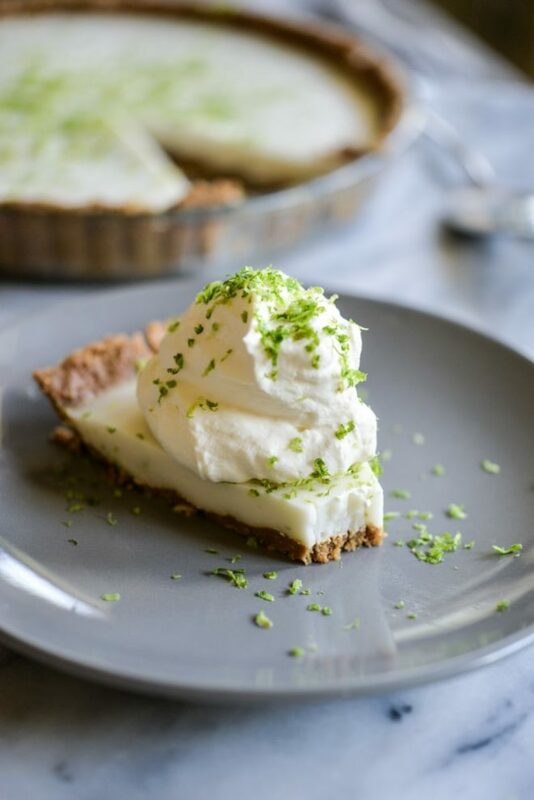 This No-Bake Key Lime Pie is beginner-level easy and meets a WIDE variety of allergen requirements. It's gluten-free, dairy-free, egg-free, and (of course) fuss-free with no-bake instructions. It's also quite possibly one of the most delicious desserts I've ever created. It's been a while since I worked so hard on a recipe! I have to admit, friends, I'm not a natural dessert maker. What I AM semi-natural at in the kitchen is savory cooking! I can take a protein, some fat, a veggie, and a starch and whip it into something delicious with very little critical thinking. It's intuitive for me. What is NOT intuitive for me is chemistry. I was more of an OCD science class student who kept (and referenced) obsessive notes vs. the natural student who just got it. I had to study and work really hard. 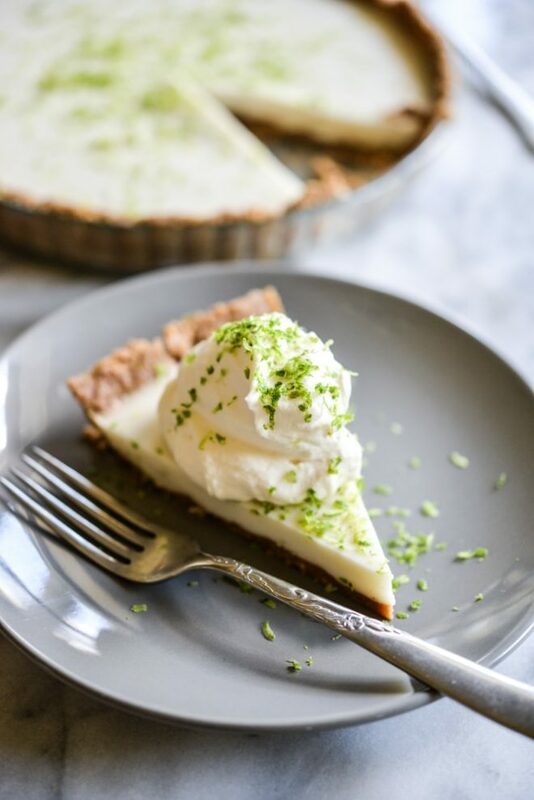 I knew I wanted to bring you a key lime pie recipe. 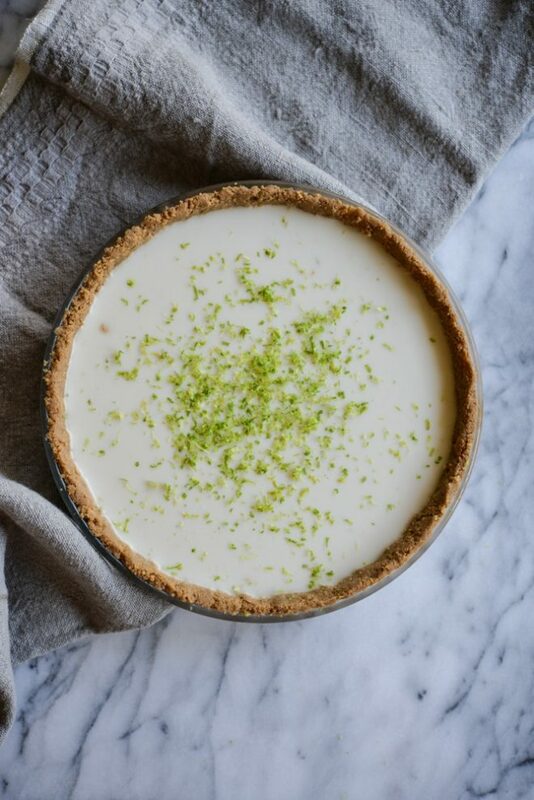 In fact, one of my college mentors asked me (now years ago) for a healthier key lime pie recipe. I do my best to remember all promises and, regardless of how long it may take me, I also do my best to make good on them. SO, here you are my sweet friend, Kathy DiSanto! Years later (4? maybe 5? ), I'm still thinking of you and thrilled to make good on this edible thank-you for your wisdom and friendship. 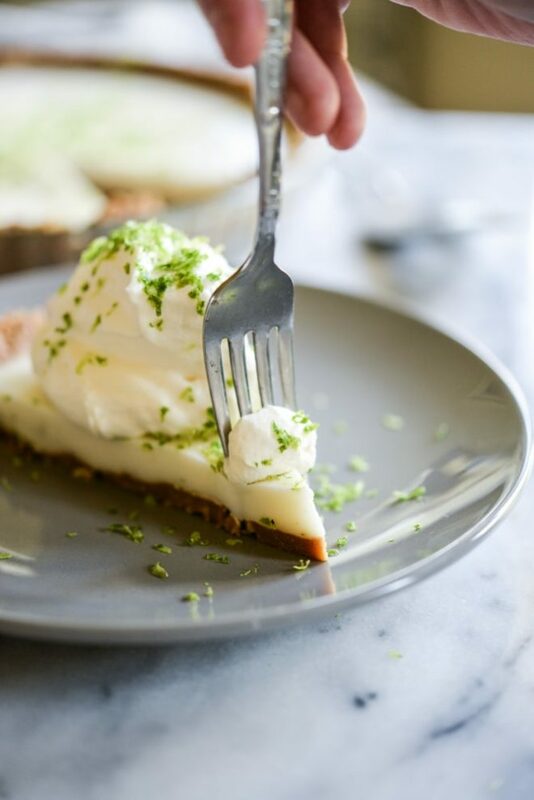 When we were working on this recipe, I came to a fork in the road …we could either continue with a very classic curd-based key lime pie filling (requires eggs and a touch more finesse in the kitchen) OR we could opt for an easier/allergen-friendly no-bake alternative. I asked on Instagram and you all provided an overwhelming number of votes! I'm happy to report that the no-bake key lime pie option won by a landslide. I'm ALSO happy to report that, once we nailed the ingredient list, this recipe became one of the dang easiest desserts I've ever whipped up. 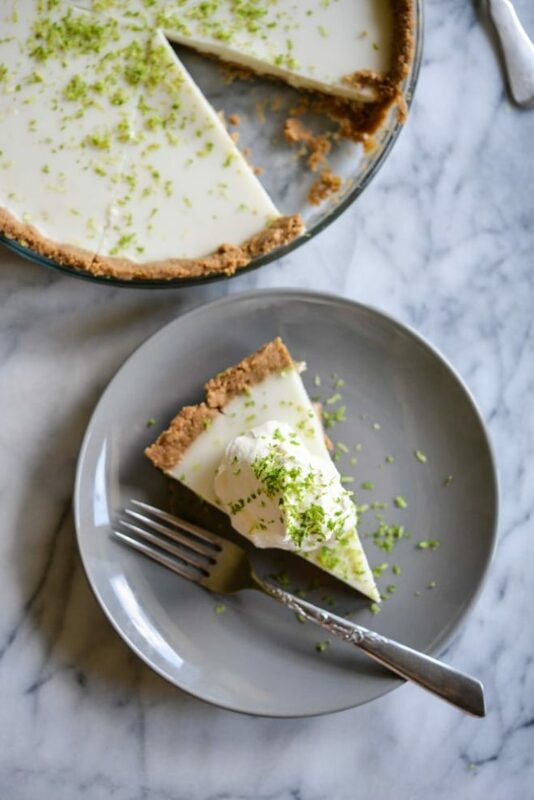 Sitting on a simple gluten-free graham cracker crust (also no-bake), the filling is a delicious mixture of fresh lime juice (key lime juice, if you have access), coconut milk (for creaminess, but not coconut flavor), a little honey, pinch of sea salt (balances the sweetness), and gelatin. The gelatin adds no flavor, but does all the magic of making the texture perfect. The trick with this filling is to let the gelatin melt COMPLETELY before adding the other filling ingredients an then pouring into the crust. This step takes more patience than skill. 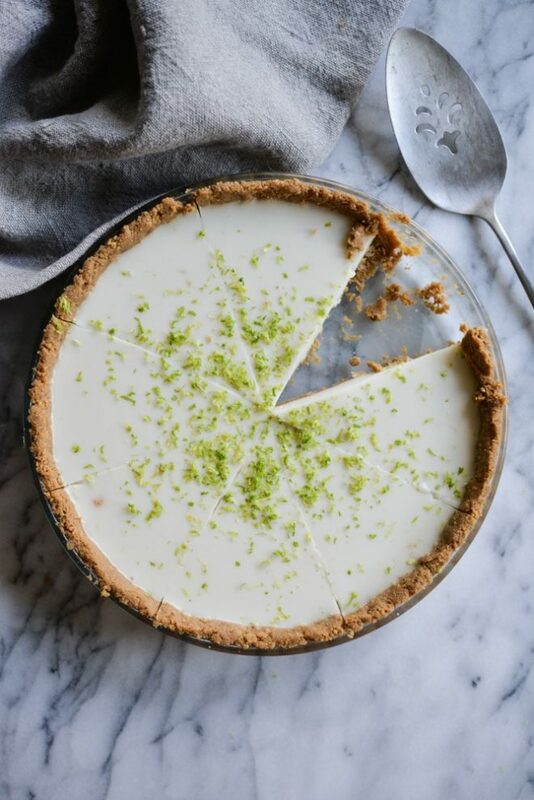 After it chills in the fridge, this no-bake key lime pie comes out absolutely perfect. I recommend serving with a dollop of whipped cream (notes on coconut or real dairy options below) and an extra sprinkle of lime zest. Invite a few friends over and enjoy this bright, flavorful, satisfying dessert! To make the crust, grind the graham crackers and butter in a food processor until an even, smooth crust forms. Press this crust down in a tart pan, creating an even layer along the bottom and the sides. Set aside. To make the filling, pour the coconut milk into a medium-sized sauce pan over medium heat. Bring to a simmer and then add the gelatin. Using a whisk, stir the gelatin in the simmering coconut milk until it is completely dissolved. This should take between 3 and 5 minutes. Once the gelatin is completely dissolved, remove from heat and let cool for 5 minutes. Once cooled slightly, whisk in the remainder of the ingredients. Pour the filling into the pie shell and then chill for at least 4 hours, or until set. 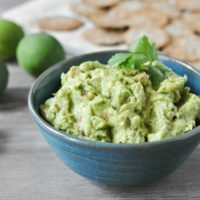 Serve with coconut whipped cream (find an unsweetened recipe in my book or a sweetened one in this post) or serve with real-dairy whipped cream (find a recipe in this post). Yay! 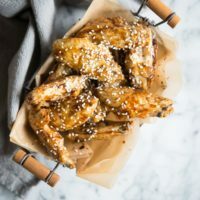 I’ve been waiting for you to post this recipe since you first talked about developing it. Any suggestion for an alternate crust? The ingredients in GF graham crackers make my tummy rumbly. Do you think a date and nut crust would be good with the key lime filing? Thanks! Nope! The butter in the graham cracker crust keeps it from sticking. If making a night ahead and the pie will be chilling over night, should you cover the pie or be concerned about a film forming or anything? 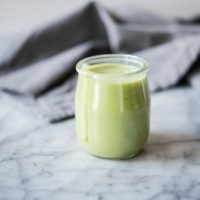 Any suggestions for substituting the coconut milk? You can try heavy cream if you tolerate dairy. This was delicious!! I made it for my hubby’s birthday pie. I hit an snag and wondering if you could troubleshoot…the top of my pie looked just like your picture (Gorgeous white) but the inside was a lite yellow/greenish jello stuff. Any thoughts?? That is really interesting! It’s hard to know where the deviation could have occurred, not being in the kitchen with you. It sounds like the milk rose to the top from the juice …which is an issue we never ran into during all of our experiments. It’s possible that the milk was too hot when mixed with the juice and then placed in the pie crust …maybe let it cool more next time and see if that helps? 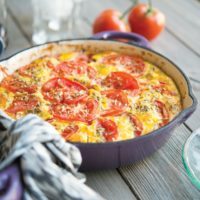 I was so excited about this recipe! I had a big party to attend today and I was bringing dessert. I got all the ingredients, squeezed the key limes, and followed the recipe exactly. After letting it sit for 12 hours, I finally took a taste of the gorgeous key lime pie and it was awful 🙁 I’m so disappointed. I ended up rushing to make peanut butter chick pea freezer cookies instead. The pie’s look and texture were perfect, but the flavor was that of coconut milk with a hint of lemon. It was awful. I got 3 opinions and one said it tasted like “weird butter and lemon” but everyone agreed it was inedible. I’ve never left a negative recipe review before but seriously, this one is bad 🙁 bummer. I’m sorry your pie didn’t turn out, Kim. Others have made it with great success, so without being in the kitchen next to you, it’s hard to say where it went wrong.